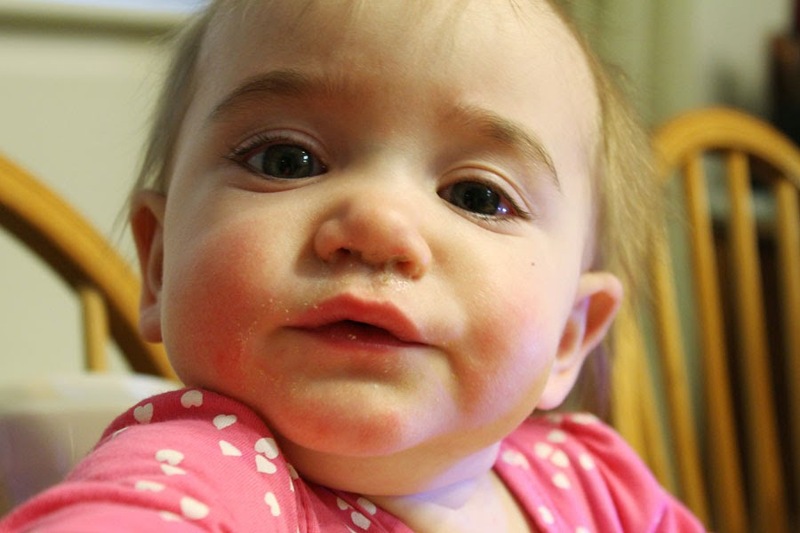 All Four Love: Boogie Wipes Review & Giveaway! 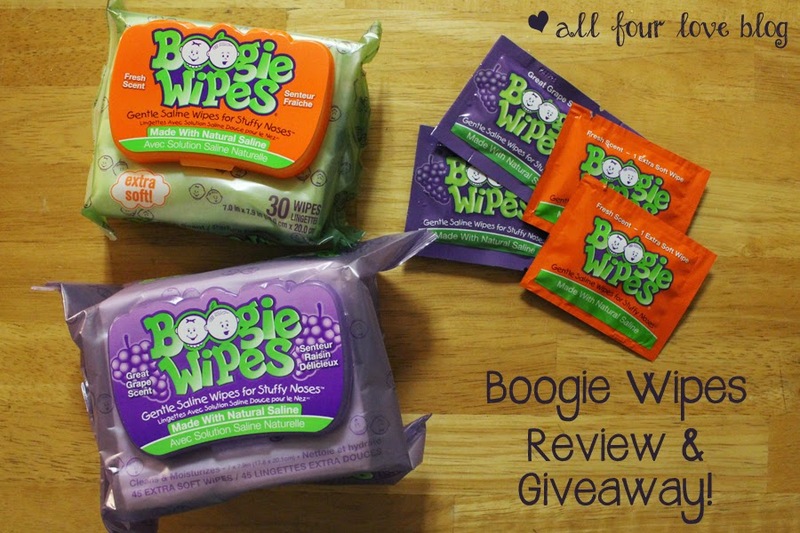 Boogie Wipes Review & Giveaway! What, what! Giveaway #3 has landed and it's going to save some sleeves! Boogie Wipes have made an appearance at All Four Love before; they're one of the essential baby items in our baby care tackle box. Look, there they are on the bottom! Whether it is cold season, allergy season, or just that perpetual runny nose that kids seem to have, we are always stocked with Boogie Wipes. In the tackle box, in the diaper bag, in the car, at daycare...everywhere. Founded by entrepreneurial Moms Julie Pickens and Mindee Doney, Little Busy Bodies, Inc. was established in May 2007. Using their business background, they hit the ground running with their idea for saline nose wipes as a solution to kids' sore, red, runny noses. After intensive R&D, surveys, hiring a chemist, and working with manufacturers, they sold their first package of Boogie Wipes in December 2007. In 2012, Little Busy Bodies partnered with Nehmiah Manufacturing, marketers of Pampers Kandoo, to continue expanding their brand and commitment to improving their community. My kids hate having their noses wiped with tissues. HATE IT. It's like wrestling an alligator the second they see me reach for a tissue. I don't blame them; kids get that gunky green crust all over their nose and upper lip and of course, one tissue wipe doesn't do it, so you're left to wipe and wipe and wipe. Dry tissues don't work well and baby wipes are too moist and sting if the skin is raw. Poor noses. With Boogie Wipes, however, I have gotten some of the most gunked up stuff of my kids' faces with ONE swipe and no fight. One swipe and they're back on the go because, let's be honest, with most toddlers you only get one swipe, so it needs to count. The super soft, alcohol free, saline wipes have the perfect amount of moisture to de-gunk any little face without bothering an already irritated nose. Now that Charlie is older, he knows what Boogie Wipes are and brings me the tub or package whenever he needs to blow his nose. He loves them! They're also perfect for other gross toddler ailments such as morning eye gunk and gross earwax. Oh, the things we parents clean up! That's his "I did it!" face. Charlie's favorite is the grape scented wipes - he calls them "purple blows." As in, "My nose is runnin'! I need a purple blow, Mommy!" Also, as you can see, his gash from the other day is healing nicely. Boogie Wipes come in 10, 30, 45, and 90 count packages and in three scents (fresh, unscented, and grape). We keep our smaller packs in the diaper bag and tackle box and the big tub ready to go on the bathroom counter. They are widely available at Target, Toys R Us, Walgreens, and WalMart and if you follow the Boogie Wipes Facebook page, you can usually find a coupon or two! Want to try out Boogie Wipes for yourself? Enter the giveaway below! The lucky winner will get one 2 ounce can of Boogie Mist, a gentle saline mist for stuffy noses, and two 10-count packages of Boogie Wipes in fresh scent and grape scent. You're little one's nose will thank you. If you'd like to learn more about being a business Mom, Julie Pickens shares her entrepreneurial knowledge with other inventors and business owners through speaking engagements and media platforms. She encourages Moms to embrace their strengths in the Business of Behind the Boogie; a blog which guides them in their journey as an entrepreneur. All right, I try not to 'like' too much on Facebook, but I already like boogie wipes, and how could I not try to enter for this giveaway? I have been holding out for the giveaway that most pertains to me and this is it!!!! I hope I get lucky. I was always skeptical of boogie wipes when I first saw them, like do boogies really need their own wipes!!! But they do! Miles has sensitive skin and I should note that these are the only things that don't give him a rash when it comes to wiping his face. Great giveaway, wishing myself luck!!! Lol. Sounds like an awesome invention and time saver! I lay him down and sit on top of him with his arms pinned (of course no actual weight on him). It's the ONLY way to get his whole nose clean. This kid hates getting his nose touched! I have gone as far as distracting with food...even..gasp..sweets.